Redemptorist Father Francis Freel, who served for a quarter of a century in Brazil and was Superior of the Vice Province of Campo Grande, died of cancer July 18 at St. John Neumann Residence in Saratoga Springs, NY. He was 87 years old. A native of Valley Stream, Long Island, he was born April 26, 1920, the son of the late James and Anastasia Dillon Freel. He was baptized in Holy Name of Mary Parish; the family soon after moved to St. Raymond Parish in East Rockaway, Long Island, where he attended grammar school. Following a year of public high school, Father Freel was accepted at the Redemptorists’ St. Mary’s Seminary in North East, PA, and continued his studies for the priesthood at Mount St. Alphonsus in Esopus. He made his first profession of vows in 1941 and his final profession three years later. He was ordained to the priesthood June 23, 1946. As was the custom of the time, Father Freel and most of his classmates received their first assignments as missionaries in South America. From 1947 to 1950, Father Freel served in Ponta Pora, Brazil; then in Tibagi (1950-56), Aquidauana (1956-67), Campo Grande (1959-67) and Ponta Grossa (1967-72). He was rector in Aquidauana and Ponta Grossa and served as Vice-Provincial Superior during his years in Campo Grande. Father James Small, who was in residence with Father Freel in Campo Grande, described his confrere as "a very dedicated person, very good in community, great at telling jokes, and very personable." In Father Small’s eyes, Father Freel had one flaw: "He was a tremendous Yankee fan – I’m from Boston!" As a community man, Father Freel "was the kind of person who was always making sure things were working," according to Father John Hennessy, who served with him in Tibagi. He added that Father Freel organized the altar boys there and, having a good ear for music, also a group of choir boys. In 1972, Father Freel returned to the United States, serving in the Portuguese Apostolate at St. Boniface Church in Philadelphia from 1972-73. He then served at Our Lady of Perpetual Help Church in Manhattan for a year and at Mount St. Alphonsus in Esopus the following year. In 1975, he was named rector of St. Gregory Church in North East; in 1981, he became rector of St. Joseph Church in Odenton, MD; and in 1987, he was chosen as rector of Our Lady of Perpetual Help Church in Manhattan. "He was a good leader, as you can tell by his being named rector of a couple of places in Brazil and pastor and superior of three parishes up here. His communities liked him and he took care of the fellows," said Father Lawrence Lover. "Frank was also very good with young people because of being so athletic. He especially loved baseball and basketball and so all the school kids knew him." 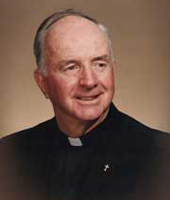 Father Arthur Gildea, who knew Father Freel both from North East and from Saratoga Springs, said, "He was a great pastor, very good with people, very caring. He also loved having surprise birthday parties – for himself!" Father Freel was appointed to San Alfonso Retreat House in 1998 and to St. John Neumann Residence in 2000. Father Gildea said he was always happy to celebrate Mass with the confreres at Saratoga Springs and "was a positive influence on the community." Father Freel’s appreciation for sports was undiminished to the end. "I just hope he wasn’t too disappointed when he walked up in his Yankee cap and found out St. Peter is a Mets fan," Father Gildea said. Father Freel is survived by a brother, Donald Freel, of New York; a sister, Pat Champeau, of Spring Lake Heights, NJ; and about two dozen nieces, nephews, grandnieces and grandnephews.